Texas has 254 institutions of higher education, including 37 universities and one of the largest community college networks in the United States. The state also has one of the most populous and diverse college student bodies in the nation, with more than 1.5 million students enrolled in a post-secondary program in fall of 2017. This volume and variation has made online learning increasingly important for both students and colleges. Since 2008, participation in online and blending courses has grown 11.5 percent at public universities in Texas, allowing more and more students to work toward their degree. But how do students narrow down and select the best Texas online college for them? Learn how to identify top schools, how residency works for online students and why accreditation means everything when earning a degree. How Much More Do College Grads Make? For this year's college rankings, our analysts carefully reviewed statistical data from multiple sources for more than 7,500 postsecondary institutions so that you could easily evaluate schools based on what matters most to you. For each school, we applied the eligibility criteria outlined below, then ranked schools and programs based on four ranking factors. Dozens of data points were used to calculate a weighted score for four ranking factors: quality, affordability, flexibility and program (in order of significance). To determine quality, which was the most important consideration for all AS Online rankings, the most impactful data points were acceptance and graduation rates; for affordability, tuition2 and grants; for flexibility, part-time enrollment offerings; and for program, degrees conferred in that program area. 1 Our Best Vocational Programs rankings included data for both online and campus programs. 2 Both annual in-state and out-of-state tuition rates were used in our methodology; however, our Rankings Tool currently only displays annual in-state rates. Finding the best of anything is always subjective. The best online college for a freshman in Austin is likely a much different choice for a working mom in El Paso. The good news is, many online colleges and universities in Texas have stepped up their blended and online programs to meet the needs of their students. This includes more affordable tuition for online programs, faculty trained in online delivery, state-of-the-art tech platforms and more. But which online colleges in Texas stand out above their institutions peers? Find out below. More than 70 full degree programs are available completely online at Texas A&M University-College Station. The vast majority, 47, are graduate programs that culminate in master's degrees. There are also 24 certificates and one undergraduate program. The school offers both web-based on-campus courses and web-based off-campus courses, the former of which do not include on-campus fees in their tuition costs. All distance learners must first apply for admission to the school, and the process is the same as it would be if they were applying for on-campus admission. All applicants are required to pay a non-refundable $65 application fee. Distance learners have off-site access to the school's academic success center, which provides resources and assistance to students from all backgrounds and fields of study. OGAPS, the Office of Graduate and Professional Studies, is dedicated specifically to serving the school's graduate students, including online learners. All students also have access to IT assistance, tech support and software assistance. Online students also have full access to the university's libraries and all included services, as well as to its writing center and testing services. The school also provides a list of services that are not directly related to academics, including counseling, multicultural services and ombuds service. Financial aid is available to online learners at both the undergraduate and graduate levels, and the school also offers a variety of scholarships to eligible students, both university based and regional. Some scholarships are based on merit, while others are based on leadership, participation or financial need. Every single 100% online student at Sam Houston University is eligible for a $1,000 60x30 scholarship, provided they enroll in an approved degree program. There are 9 undergraduate degree programs available to distance learners, including criminal justice, nursing, psychology, sociology, business, history and liberal studies. Offerings at the graduate level are even more comprehensive, with more than 2 dozen programs culminating in master of arts, master of science, MBA, MEd and EMBA and MAg degrees. There are also 2 doctoral programs for educators pursuing an advanced degree and several certificate programs. In all, more than 40 programs are available 100% online. The third-oldest university in Texas, SHSU maintains an online campus with dedicated sections for students, prospective students and faculty. Most coursework is delivered through the Blackboard learning management system, which students will use to receive and submit assignments, communicate with peers and professors, receive grades, view lectures and receive updates and announcements. There are also several apps that the university uses in conjunction with outside corporations, which distance learners can use to enhance their online education. Credits earned at SHSU Online are identical to those that students would get if they took classes on campus, and there is no difference in the diplomas graduates receive. The university also offers a range of grants, scholarships, loans and work-study programs to help distance learners pay for college, and online learners receive access the same access to student services as on-campus students. Among the offerings are academic advising, careers services, an online bookstore, library services and career services. The vast majority of the online programs available at Midwestern State University result in master's degrees, although there are four undergraduate programs that culminate in bachelor's degrees, including an RN to BSN and degrees in respiratory care, applied arts and sciences and radiologic sciences. Graduate programs also include nursing and radiology, as well as master's degrees in education, business, criminal justice and human resources. Although students will use the MSU portal as their home base for online learning, most coursework, lectures and assignments will be delivered through the D2L learning management system. Online students will be assigned an academic adviser depending on their college of choice, just like their peers who attend classes on campus. Distance learners also enjoy the benefits of counseling, both academic and personal, as well as disability support services, and career services, the latter of which includes an entire online Career Management Center. Several scholarships are available, and the school has compiled a list of online resources designed specifically for helping online learners secure financial aid. Out-of-state students might be able to take courses at MSU, but requirements and compliance standards vary by state, so the school has developed an interactive map with a state-by-state breakdown. Students who aren't sure if online learning is right for them are encouraged to take the school's distance education self evaluation, and all new students, including distance learners, are required to participate in the school's online orientation. Online learners are required to participate in only 2 of the 3 orientation modules. The Texas Tech University eLearning and Academic Partnerships program exposes distance learners to a wide menu of course and degree options that are beyond the scope of most individual schools. Once accepted, students can choose between 6 fully online undergraduate degrees, including general studies, plant and soil sciences, early child care and applied leadership. There are also more than 2 dozen master's degrees available across a range of disciplines, 7 doctoral degrees and a variety of certificates and certifications, all of which can be completed 100% online. There's also a master of education and 2 doctor of philosophy degree programs that are delivered in a hybrid format, which requires both online and face-to-face instruction. The program also opens students to study at 6 regional sites across the state, but any of those programs will require instruction at those physical locations. Worldwide eLearning courses at Texas Tech are taught by the same faculty who instruct traditional students on campus and distance learners enjoy wide scheduling flexibility, with the option to take anything from a single course in a semester all the way up to full-time enrollment. The Military and Veterans program is especially robust at the university, and that program includes distance learners. The school also offers transfer scholarships to incoming community college students, and out-of-state distance learners are offered the same tuition rate as online students who reside in the state. Coursework is mostly delivered through the Blackboard learning management system, although students will use a variety of technology and media throughout their programs. Distance learners receive help with Blackboard specifically and IT assistance in general, as well the full menu of services enjoyed by their on-campus peers. More than 500 students are enrolled in the Tarleton State University Global Campus, which is the school's platform for online education. More than 15 degree programs are available at the graduate and undergraduate level. Bachelor's degrees include criminal justice, veterinary technology, manufacturing and industrial management, health professions, IT, business, applied science and psychology. Master's degrees are available in many of the same fields of study, as well as English, human resources, education, music, public administration, agriculture and engineering. Students who prefer some face-to-face instruction can pursue their degrees through a blended format by taking some classes in the day, in the evening or on the weekends on campus or at locations in Waco, Fort Worth, Midlothian or Stephenville. That option, however, is only available for degree-completion programs and is available only to TSI-complete students who have earned at least 30 credits with a GPA of 2.0 or better. No matter the path, the average online learner can expect to be in a class with a 19:1 student-to-teacher ratio. Global campus students enjoy the same advantages as their peers on campus, with services including research and study, academic advising, computer labs, library services, job fairs and other career services, as well as disability services. Some courses do require some on-campus instruction, but no program comes with a required on-campus residency. Most coursework is delivered through the Blackboard learning management system, which students will use to receive and submit assignments, check grades, communicate with professors and peers, and to receive updates and announcements. Students are invited to take a sample course to become familiar with the format before they commit. The University of Texas at Dallas offers distance learners several unique programs, including a series of "chess in education" courses. There's also several graduate options through the Jindal School of Management, including an MBA, a global leadership executive MBA and several master of science degrees. Finally, distance learners can pursue an online master's degree in criminology or they can simply take a few individual online courses. As part of the Electronic Campus, online learners have access to a variety of courses offered by other schools throughout the state of Texas. The school's e-learning community maintains a wide social media presence and also publishes blogs and newsletters. Students are reminded that online courses demand the same academic rigor as those taught on campus, and tests may be administered by proctor, by email or they may be embedded in the courses. With the exception of proctored exams, virtually all courses can be completed 100% online and require no on-campus instruction. A variety of technologies are utilized in distance learning, and students will communicate with instructors through text conferences, threaded discussions, email, real-time chat and audio lectures. Once accepted into their program of choice, students are provided with a variety of electronic resources, including a suite of software and plugins. Online students enjoy most of the same student resources as their peers who opt for traditional, on-campus study, including academic advising, career and library resources, accessibility services and a variety of financial aid offerings. Online learners also benefit from the eLearning helpdesk and several other dedicated support mechanisms designed just for them. The soon-to-be Division II University of Texas at Tyler offers online degrees at a variety of levels and in a variety of formats. For example, a bachelor of applied arts and sciences degree completion program is available to undergraduate students and for graduate students, there's an MBA with an online option delivered through an accelerated, 7-week format. There are also graduate degree options in fields of study like education, English, human resources, industrial management, kinesiology, nursing, and counseling. There are also 7 certification programs in the fields of accounting, nursing and education. Finally, there are several executive and HyFlex format degrees, including a PhD option. HyFlex is the university's terminology for hybrid programs, which are conducted mostly online, but that are supplemented with some face-to-face instruction. Not only are there 4 full HyFlex programs, but students interested in the format can take individual HyFlex classes in fields like education, psychology, business, arts and sciences, nursing and health sciences, and engineering. Distance learners will receive a Patriot email account, but most coursework will be delivered through the Canvas learning management system, although some communication will take place through message boards and video chat. Prospective students who aren't familiar with the format or who are not sure if distance learning is right for them are invited to take a video tour of an online course and complete an online preparedness questionnaire. The UT Tyler IT department is on staff for technical support, and distance learners enjoy the same academic and personal support as their on-campus counterparts, including academic advising, career services, library services and counseling. Most of the 16 fully online undergraduate programs offered through the University of Texas of the Permian Basin are available in an accelerated format. Most of the bachelor's degree programs require 120 credits to complete, but since the accelerated format condenses learning, many courses last only 7 weeks and offer 6 different start dates. There are also 10 graduate programs offered across fields of study like education, English, public administration, accountancy and kinesiology. Here, too, most courses are delivered through the accelerated format with multiple start dates offered throughout the year. Many accelerated graduate degrees can be earned in as little as 12 months. Students can also pursue a range of completely online certificates designed for educators and education administrators, as well as many individual web-based courses. Transfer students with at least 24 credits earned from a qualifying institution are welcome to apply, and, where applicable, the school recognizes credit by examination, including IB credit CLEP credit and AP credit. Course evaluations are available, and most work, lectures, updates, assignments and communication will be delivered through the Canvas learning management system. Distance learners enjoy tech support both for Canvas and other critical online learning components, as well as a range of other student services like academic and career counseling. Online learners will find their home base at the REACH Center, where primary access is provided for most course content. Since UTPB is part of the National Council for State Authorization Reciprocity Agreement and Texas Distance Education, distance learners can enroll in some online courses delivered by other schools throughout the state. The REACH center is where they'll go to learn more about these classes. Stephen F. Austin State University offers 14 full graduate degree programs to online students across various fields such as education, communications, human sciences and music. Undergraduate distance learners can pursue 2 different BBAs or several different bachelor's degrees in the fields of nursing, education and human sciences. There are also several certificate programs and a range of individual courses available to online learners. Motivated homeschoolers and high school students can pursue the school's concurrent and dual-credit enrollment program, which offers them college credit while they're still in high school. Prospective online students are encouraged to take advantage of the school's readiness tutorial, which exposes applicants to the feel and format of distance learning before they apply, and gives them a chance to get familiar with D2L, which is the learning management platform they'll use most frequently throughout their course of study. There are also individual D2L tutorials and how-tos, along with full tech support. Distance learners can visit a dedicated page designed specifically to link them to the R.W. Steen Library, where they can conduct research, read e-books, explore journals and search databases. Library professionals are available and distance learners can take advantage of interlibrary and document-delivery services. Just like their campus-based counterparts, distance learners will have access to disability services, career services and counseling services, the latter of which is delivered by licensed, certified professionals. Academic advisement and tutoring services are also available, and online students of any discipline can submit papers to "virtual tutors" via the online writing lab or OWL. The University of Houston offers 2 dozen fully online graduate degree programs in the fields of technology, engineering and education, including the first web-based graduate subsea engineering degree in the country. There are also 4 fully online undergraduate programs, including a BA or a BS in psychology, a BS in retailing and consumer science and an RN-to-BSN program. Those exact same undergraduate programs can also be taken in a hybrid format, which requires distance learners to engage in some face-to-face instruction. The level of required on-campus work varies by program and is determined by the instructor. Seven of the graduate programs can also be completed in the hybrid format. In all, the university offers more than 1,250 online courses and many Saturday classes to further accommodate distance and hybrid learners. Session 2-6 courses are short-session courses, which are condensed courses that students can take in the face-to-face, online or hybrid formats. All 4 of the online/hybrid undergraduate degrees are offered as degree-completion programs, which means incoming students need to have completed at least 2 years of college. Advisors will help prospective transfer students determine which credits are eligible for transfer, and students can also transfer credits they earn at the University of Houston to programs at other schools. Online learning is delivered through the Blackboard learning management system, and students are expected to log in often to keep up with coursework, receive announcements and to communicate with instructors and classmates. Although scheduling is designed to be flexible, many classes and assignments do include hard deadlines that students are expected to meet. There are 4 bachelor's degrees available through online study from the University of North Texas. The Bachelor of Science in Rehabilitation Studies was created to meet the constantly growing demand for rehabilitative services for individuals with disabilities. Graduates with this degree are prepared for entry-level positions in the rehabilitation and allied health professions performing specialized roles in consumer advocacy, service provision and service coordination. The degree also lays the proper foundation for those interested in pursuing graduate study in the rehabilitation and allied human service fields. The Bachelor of Science in Criminal Justice is designed for individuals interested in beginning careers in a wide range of professions, including law enforcement, corrections, the courts, investigative services, corporate security and loss prevention, as well as for those interested pursuing graduate study. The Bachelor of Science in Information Science provides students with the knowledge and skills needed to pursue careers in information systems and technology throughout all employment sectors. Job titles associated with holders of this degree include Systems Analyst, Knowledge Manager, Data Mining Specialist and Information Architect. Finally, UNT's online Bachelor of Applied Arts and Sciences degree program is designed for students with 45 or more previously-earned college credits. Students choose 3 concentration areas from among dozens in order to build on their individual interests in those areas and become more attractive to potential employers. With the exception of the BS in Information Science, all coursework for UNT's online bachelor's degrees can be completed 100% online. The BS in Information requires some on-campus non-major coursework. Classes are presented in an asynchronous format that allows students to complete their studies according to their own schedules. UNT offers an abundance of support services and resources for online students including career planning services, tutoring, disability and veteran's services, internship opportunities and access to the extensive resources of the Distance Learning Services of UNT's Libraries System. Tuition: Texas residents: $280.11; Oklahoma residents: $330.11; All others: $695.11. Application Deadline: Freshmen: Spring: December 1; Summer: May 10 - July 1, depending on course length and specific Summer Session; Fall: March 1. GPA: Freshmen: no minimum high school GPA. Admission considers student's ranking in their graduating class. Transfer students: Fewer than 30 college credits: 2.50; 30-44 college credits: 2.25; 45 or more college credits: 2.0. Standardized Test: Freshmen: SAT/ACT required. Minimum scores vary by student's ranking in high school graduating class . Transfer students: Fewer than 30 college credit hours - ACT/SAT required. Minimum scores vary by high school graduation ranking. 30 or more college credit hours - no standardized test requirement. Email: Freshmen: unt.freshmen@unt.edu; Transfer students: unt.transfer@unt.edu. The King's University is a private, evangelical institution affiliated with the Gateway Church located in Southlake, Texas. The King's University offers 4 ministry-related bachelor's degrees that can be earned entirely online: Bachelor of Christian Ministries, Bachelor of Biblical Counseling, Bachelor of Biblical and Theological Studies (with optional Messianic Jewish Studies concentration) and Bachelor of General Christian Studies. All 4 degree programs require of 124 credit hours of coursework that includes general education, Christian foundation, major subject and elective courses, as well as completion of a Junior Ministry Practicum. Degree completion times vary due to several factors, among them the specific program chosen and the number of previously earned credits applied to the degree program. Students can transfer in up to 90 qualifying credit hours. Credits may also be awarded through the CLEP exam and for life experiences. All courses are presented in an asynchronous format, allowing students to log in and complete their coursework according to their own schedules. Distance learners have access a number of important support services offered by TKU's Student Success Center, including math and writing tutoring, academic coaching and advising, study skills training and more. Research materials, including access to over 5,000 eBooks, are available to online students through the TKU Library. The King's University is accredited by the Transnational Association of Christian Colleges and Schools (TRACS) and the Commission on Accreditation for Biblical Higher Education (ABHE), both of which are members of the Council for Higher Education Accreditation (CHEA). TKU online programs are available to residents in all 50 states and the Virgin Islands, but are unavailable to residents of Puerto Rico and the Northern Mariana Islands. Application Deadline: Spring: December 19; Summer: 2 weeks prior to each session start date. GPA: Freshmen: 2.5; Transfer: 2.2. Standardized Test: Normal admission for freshmen and adult students with no previous college: SAT: 1075; ACT: 21. Academic probation for freshmen and adult students with no previous college: SAT: 1050; ACT: 20. Transfer students: No requirement. LeTourneau University, a private, interdenominational Christian-affiliated institution, currently offers 19 bachelor's degrees that can be earned through fully online coursework. Degrees are available in a range of fields such as business, education, healthcare and nursing, aviation and aeronautical science, computers, criminal justice and theology. Of particular note are LETU's Bachelor of Business Administration, available online with 5 concentration options, and Bachelor of Science in Aviation Management, available with Professional Pilot, Aircraft Dispatch, Maintenance and Homeland Security concentrations. Theology majors offered include Biblical Studies & Ministry, Christian Ministry, Scripture & Theology and Theological Studies. While students can complete their LETU bachelor's degrees fully online, some programs ? the BS in Aviation Management, for example ? offer courses both online and on campus, and allow students the option of combining the two formats if they choose. All programs are presented with a Christian worldview based on a combination of "faith, learning and living." All LETU online bachelor degrees require a minimum of 120 credit hours (some programs may require more), typically requiring 4 years of full-time study to complete. Actual completion times may be less, however, depending on the number of previously earned college credits applied to the degree program. Course credit may also be available through several other means, such as CLEP, AP and departmental examinations, and prior work and life experience (via submittal of a prior learning portfolio). However, at least 30 credit hours must be obtained from LeTourneau courses. Online LeTourneau students enjoy a range of important support services and resources, including personal and spiritual help through the Counseling Center, technical help and access to online library resources through the IT KnowledgeBase, and tutoring services through tutor.com. Application Deadline: Fall I: August 10; Fall II: September 14; Fall III: October 19; Spring I: January 10; Spring II: February 14; Spring III: March 28. Standardized Test: SAT: min. 1030; ACT: min. 20. The University of Texas Rio Grande Valley offers 4 bachelor's degrees that can be earned entirely through online study, 3 of which are available in a traditional (16 week) semester format. The Bachelor of Science in Criminal Justice is designed for students interested in beginning or advancing their careers in the criminal justice and law enforcement fields. Study topics covered include law and law enforcement, juvenile justice, crime causation, corrections and the courts. UTRGV's Bachelor of Applied Technology in Health Services Technology program prepares students for leadership positions in health care, education, consulting, corporate training and other related fields. An A.A.S. degree in a health related major is a prerequisite for admission into this degree program. The Bachelor of Multidisciplinary Studies program allows students to customize study in a variety of disciplines to create their own specialized degree and expand their career and employment opportunities. All 3 of these degrees require 120 credit hours of coursework consisting of general education, major subject and elective courses. All degree requirements can be completed in as little as 36 months. UTRGV's Registered Nurse to Bachelor of Science in Nursing (RN to BSN) degree program is for currently-licensed RN's with an associate degree in nursing or nursing diploma who are interested in obtaining the advanced practice and leadership skills gained with a BSN to advance their nursing careers. The program is available in an accelerated (7-week semester) format and consists of 27 credit hours of coursework that can normally be completed in 12 months. Both online and on-campus students can avail themselves of a wide range of admission, registration and financial aid information and assistance via UTRGV's U Central Division. Other student support services include tutoring and academic advisement through the UTRGV Learning Center, writing assistance from the Writing Center and the online resources of the UTRGV University Library. Application Deadline: RN-BSN - Fall I: August 21; Fall II: September 17; Spring I: December 2: Spring II: January 28. All other bachelor's programs - Fall and Summer: February 1; Spring: November 1 (these are priority admission dates). GPA: 2.5 for RN-BSN. GPA is considered with other factors for the other online bachelor's programs, but no state minium. Standardized Test: No for the RN-BSN program. Other bachelor programs, ACT/SAT scores considered but no state miniumum. Wayland Baptist University is a private school, established in 1908, that offers several online undergraduate programs. Distance learners can pursue bachelor's degrees in Applied Science, Business Administration and Psychology. As a Christian university, WBU also offers the Bachelor of Christian Ministry degree online. These undergraduate programs require approximately 120-124 credits and can take up to 4 years to complete. This flexible online school offers 4, 11-week terms per year, with classes available year round, for maximum flexibility. Incoming students may be able to transfer previously earned credits from regionally accredited colleges and universities as well as some nationally accredited institutions. An academic adviser must evaluate those potential transfer courses not listed in the Texas Common Course Numbering System. Online students may also earn up to 12 semester credits for work experience as a civilian or in the military. Active duty military receives a substantial online tuition discount. Online students pay the same flat $395 per credit hour regardless of their location. When applying, online students should consult one of the school's financial aid specialists to ensure they consider all scholarship, loan and grant opportunities available through WBU. Additionally, WBU takes pride in the fact that its distance learners have 24/7 technical support and can receive research help from librarians entirely online in real time. Prospective students must submit official transcripts and ACT or SAT scores. Those students who visit the campus before they apply, or have a letter from a school counselor verifying financial need, do not have to pay an application fee. Lamar University is a public research institution with approximately 15,100 students. Lamar offers numerous bachelor's degrees in fully online and hybrid formats. Distance learners can choose from programs such as Communication, Computer Science, Criminal Justice, Industrial Engineering, Industrial Technology, Management and Sociology. Courses for these degrees can be taken as accelerated, 8-week semester sessions or traditional 15-week sessions. Courses are asynchronous with multiple start dates throughout the calendar year. In this flexible program students can work at their own pace while managing a busy schedule or a full-time career. Prospective students can apply using the ApplyTexas application to save time and money. Incoming students must submit SAT or ACT scores. For unconditional admission, applicants must send in their high school transcripts that show class size, class rank and reflect at least 14 high school credits in college preparatory courses. Additionally, students should have graduated in the top 10% of their high school class. Those first-time applicants who don't meet unconditional admission standards, but who have at least an 880 on the SAT or a 17 on the ACT will be considered for admission. Online students can take advantage of the school's career center, library resources and technical support to help them complete assignments and prepare for the competitive job market. Lamar reserves scholarship opportunities for incoming first-year students, including the Cardinal Elite Scholarship, and transfer students, such as the merit-based Transfer Academic Excellence Scholarship and the Phi Theta Kappa Scholarship. Students typically need to apply for these types of funding opportunities with separate applications before marked deadlines. Established in 1901, Texas Woman's University is a co-educational school. The school offers both online and hybrid degree completion programs in which most junior- and senior-level courses can be completed remotely. Distance learners can earn their bachelor's degrees in areas such as Accounting, Business, Criminal Justice, Health Studies, Human Resource Management, Marketing and Sociology. Courses for these programs follow the same semester-long university calendar as their on-campus counterparts. In many cases, classes are synchronous and require group projects, participation and active online discussion. Some classes may require in-person obligations or scheduled, online meetings. Online students at TWU have access to the school's extensive library services and resources, including online research help from librarians, training and tutorials. The Pioneer Center for Student Excellence promotes student engagement inside and outside the classroom and helps students locate internships, career workshops and job shadowing opportunities. Additionally, the Career Connection Center helps undergraduates who are planning for their careers with job search assistance while Student Support Services offers academic and administrative support. Applicants for online bachelor's degree programs at TWU should have at least a 2.0 high school GPA and be in the top 50% of their graduating class. Applications should also include ACT or SAT scores. Prospective students living in the state should have completed or be enrolled in the Foundation, Recommendation or Distinguished Texas High School curriculum or an international baccalaureate program. Alternatively, in-state or out-of-state applicants can submit official transcripts that reflect a history of college-preparation courses in English, Math, Science and Social Studies. Founded in 1974, University of Houston-Downtown is a 4-year state institution. With over 14,000 students, it is the second-largest university in the Houston area. UHD offers upper-level coursework for over a dozen online bachelor's degrees including Finance, General Business, Insurance and Risk management, International Business, Marketing and Supply Chain Management. Most courses in these programs can be completed online with no on-campus obligation. Depending on the major, however, some site-based classwork may be needed, especially if the subject area requires clinical or laboratory experiences. Applicants who graduate in the top 25% of their high school class are guaranteed admission to the UHD. All applicants should have at least a 2.5 GPA, an 18 on the ACT or 930 on the SAT. UHD offers student counseling services to make sure all degree seekers, both on-campus and distance learners, receive emotional support as needed and get the most out of their program. Online students can apply for internal scholarships, some of which are offered for incoming freshman by the university as a whole. Alternatively, individual departments may award scholarships and financial aid to those students who show great promise in those areas. UHD Veteran Services also reserves a scholarship for full-time students who qualify as active duty service members or veterans. Incoming students with more than 15 transferable credits are considered transfer students and must meet specific transfer admission criteria. Remedial or developmental coursework does not transfer toward bachelor's degrees at UHD. West Texas A&M University is a public institution, established in 1910, with a student body of approximately 11,000 students. The school offers a variety of online degree programs in both fully online and hybrid formats. Available undergraduate degree programs include Applied Arts and Sciences, Communication Studies, Computer Information Systems, Criminal Justice, Economics, Emergency Management Administration, Finance, General Studies, Health Sciences, Management, Marketing and Nursing. Some courses are available in an on-demand format. This allows students to take classes either in an accelerated or self-paced format. Accelerated courses can be completed twice as quickly as a regular on-campus course, with 2 accelerated courses per 1-semester time frame. In self-paced classes, students determine the length of the course based on how quickly they complete assignments. Distance learners may enroll in self-paced courses as they wish but must complete the course within 9 months of the starting date. A 3-month extension of the deadline may be purchased for $75. Incoming students can apply using the ApplyTexas Common Application. Applicants should have a minimum 2.0 cumulative GPA. The admissions committee considers an applicant's ACT or SAT scores, high school class rank, and transcripts to determine their eligibility. Distance learners have access to online technical support, full-text library access, and free, 24/7, real-time online tutoring services. Distance and hybrid students also have access to WTAMU's extensive career services offerings. Undergraduates can prepare for their future careers by taking resume workshops, interview training, and using the school's resources to locate internships and even full-time positions. Degree seekers can work one-on-one with a career counselor and pursue additional professional development training. The University of the Incarnate Word is a private Catholic institution established in 1881. The school offers virtually all of its bachelor's degrees in an online or hybrid format. Distance learners can choose between majors in Human Resources, Organizational Development, Business Administration, Criminal Justice and Health Sciences. One of the most diverse programs offered at UIW is its Bachelor of Science in Business Administration. These distance learners choose between concentrations in Accounting, General Business, Information Systems, Marketing, Social Marketing, Management or Project Management. Many undergraduates at UIW also pursue a supplementary minor concentration. Popular minors for online students include Business Administration, Criminal Justice, Healthcare Management, Human Resource Management, Leadership Studies and Psychology. Most online bachelor's degrees require 120 credit hours for graduation. The core curriculum consists of 46 credit hours and is an integral part of online education for all degree programs at UIW. Based on a traditional concept of liberal arts education, including Mathematics, Wellness Development, Computer Literacy and Philosophy and Religion, many of the required core courses are transferable from community colleges and accredited institutions. Student resources at the school include academic advising, financial aid guidance, emotional and behavioral counseling, library access and writing tutorial services. Prospective students must complete an online application and submit their high school transcripts and SAT or ACT scores. Optional application materials include AP/Achievement or CLEP Test scores, a list of extracurricular activities and letters of recommendation. Online students who are active duty or military veterans receive a substantial tuition discount. Texas A&M University-Commerce is a public research institution established in 1889. The school offers a wide range of degrees entirely online and in hybrid formats. Distance learners can pursue bachelor's degrees in Organizational Leadership, Business Administration, General Business, Business Analytics and Agribusiness in fully online formats. Hybrid options at TAMUC include Computer Science, Computer Information Systems, Technology Management, Finance, Criminal Justice and Sociology. Online courses follow a semester-based schedule. They begin and end at the same time as traditional on-campus courses. TAMUC recommends that incoming students have completed at least 4 credits in English, Math, Science and Social Studies and 2 credits of a foreign language. Those applicants who graduate in the top 30% of their class, have a minimum composite ACT score of 21, or a minimum combined SAT of 1060, receive automatic admission to the school. The university's Admissions Appeal Committee reviews those prospective students whose applications don't meet the automatic admission requirements. Incoming students are automatically considered for freshman scholarships based on standardized test scores. Funding is limited so prospective students should take their exams and submit their undergraduate application as soon as possible. Distance and hybrid learners at TAMUC have access to the counseling center for individual and group counseling, mental health screening, crisis intervention and legal advising. The school also makes a special effort to be sensitive to the needs of ethnic and cultural minorities, LGBTQ students, veterans and non-traditional students. Student resources available for online students include library resources, career services and financial aid support. The University of Texas at Arlington was established in 1895 and, with approximately 42,000 students, is the 4th largest university in the state. Online students can pursue bachelor's degrees in Public Health, Criminal Justice, Social Work, Engineering and Nursing. Distance learners interested in pursuing an engineering degree can obtain specialized degrees in Architectural, Aerospace, Construction, Electrical, Civil, Mechanical or Industrial, Manufacturing and Systems engineering. Online degree offerings at UTA are often accelerated programs that learners can complete more quickly than on-campus classes or degrees. For example, students can earn the Bachelor of Science in Nursing in as few as 15 months or the online Bachelor of Science in Public Health in only 22 months. The school is also part of the UT System Online Consortium: the gateway to many additional online degree programs and courses through the University of Texas System Institutions. The Consortium, which includes the El Paso, Permian Basin, Rio Grande Valley and San Antonio campuses and resources, offers collaborative online and hybrid degree programs between schools and affords distance learners the opportunity to work with tenured faculty from other institutions. UTA uses the Blackboard system to deliver online courses at $168-350 per credit hour, depending on the course and its corresponding department or program. Many UTA students whose major is not offered entirely online take at least some general education courses among the 1,600 individual online courses available at UTA and the Consortium. Most programs at UTA require applicants to submit their ACT or SAT scores, along with official transcripts from every institution one has attended. Transfer credits may be accepted, provided that they satisfy a degree requirement and have a "C" grade or higher. Texas A&M International University is a public university established in 1969. The school offers over 70 degrees on campus and the RN/BSN nursing degree online. This online program offers an affordable way for students to acquire nursing training for a variety of roles in patient-centered care, educational organizations, nonprofits and entrepreneurial endeavors. Courses are accelerated, entirely online and designed for working professionals. With this curriculum, students learn to draw from the arts, humanities, sciences and other disciplines to develop a diversified, culturally sensitive understanding of human health and supportive nursing practices. Distance learners also work on their critical thinking skills, problem-solving, and essential research skills in the field. Upon graduation, students can assess, diagnose, plan, implement and evaluate the vital types of evidence-based nursing care with patients and their families. The online RN/BSN degree requires 32 credit hours for graduation and can be completed in as few as 12 months. The core curriculum includes classes like Health Assessment, Cultural Determinants of Health Behavior, Nursing Research, Community Nursing and the History of Nursing. This cost-efficient program is $281.09 per credit hour and has 6 convenient start dates each calendar year. Applicants must submit transcripts verifying a cumulative GPA of at least 2.5. Incoming students must also hold RN licensure from the Texas Board of Nursing. Additionally, students are required to submit verification of a criminal background screening and drug screening before the completion of their first online course. Affiliated with the Churches of Christ, Abilene Christian University is a private, nonprofit institution founded in 1906. Online learners can take advantage of ACU's distance learning offerings in multiple ways. While the undergraduate online course offerings are limited in number, a hybrid program can be advantageous for students looking for a way to accommodate their busy schedules or to get an early start on their college career. The school offers high school students the opportunity to take college-level courses that would count toward a college degree. Popular online undergraduate course offerings include a disparate set of courses such as American History, Environmental and Technological Science, Quantitative Reasoning, Spanish, Biology and Composition, and can fit with virtually any student's required curriculum. High school students taking dual-credit online courses must submit a special student application available in the registrar's office. Additionally, they need to provide an official high school transcript and a letter of permission from their school counselor or principal. Prospective undergraduate students complete an online application and submit their high school transcripts, ACT or SAT scores. New freshman may begin classes during the spring summer or fall semesters. The fall semester has a deadline-based admissions process for first-time freshmen but, otherwise, ACU subscribes to a rolling admissions policy. ACU makes a special effort to ensure hybrid students engage in extracurricular activities that focus on the formation of students' vocational identity. Furthermore, distance learners have online library access and opportunities to meet with academic and spiritual advisors. Faculty members also guide students with a Christian worldview and promote the importance of integrating faith and learning. How can I find which online colleges offer the degree I’m looking for in Texas? 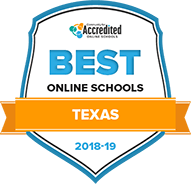 When looking for colleges that offer your program, narrow the search to exclusively include online colleges and universities in Texas that have earned regional accreditation from the Southern Association of Colleges and Schools Commission on Colleges (SACSCOC). From there, research by either checking out the program listings on the college website or contacting the college directly. Most colleges and universities have user-friendly websites that enable prospective students to sort their searches by degree type and specialization. The Texas Tech University System has a great page for its online programs that makes searching their catalogue easy. If you can’t find what you need online, reach out to colleges directly and let them know exactly what you are looking for. Someone in the registration department or a student adviser can assist you. Which online schools in Texas will accept my transfer credits or work/life experience? Online college degrees continue to grow in popularity with students worldwide as the unique advantages and benefits they offer are increasingly recognized and more fully developed. Online options also continue to gain credibility and legitimacy among institutions of higher education, government educational agencies and employers. This makes earning a bachelor's degree from a reputable, accredited online college particularly attractive for working adults looking to enhance their job prospects and ensure their knowledge and skill sets remain up-to-date. Online colleges in Texas and across the U.S. have been increasingly able and willing to assess and accept transfer credits for coursework completed at other institutions—whether earned online or on-campus. This extends to awarding credits for relevant knowledge and experience gained on-the-job, all of which makes it easier for greater numbers of aspiring students to enroll in an online college undergraduate program. All that being said, it is always best to check with your prospective school directly and let them know you have potential transfer credits. Usually, a registrar or student counselor can assist with making sure your credits are properly transferred. How Much More Do College Grads in Texas Make? Earning a college degree can mean faster job growth and higher salaries. This holds true in Texas, where jobs that require a college degree pay far more than those that require only a high school diploma. Let’s dig into the numbers specifically, and see how occupations in Texas pay according to the minimum degree level required. When looking for an online college in Texas, always start with accreditation. That said, numerous types of accreditation exist, which can make the college search and vetting process confusing. Here’s a look at the two most important accreditation types for online colleges and universities in Texas, and what they mean for aspiring graduates. Regional accreditation is the most critical stamp of approval for colleges in Texas, and across the U.S. The U.S. Department of Education recognizes six regional accrediting bodies, each with its own set of states under its purview. Texas colleges and universities fall under the Southern Association of Colleges and Schools Commission on Colleges (SACSCOC), and accreditation includes campus, blended and online programs. Increasing interest in online education paired with accreditation means an expanding presence for online colleges and universities. One example is the University of Texas at Austin, which runs an online consortium that offers students the chance to take courses and earn degrees offered at its flagship campus or from other sites statewide. Rice University in Houston is one of the nation's leading private universities and partners with Coursera to offer free online courses any student can enroll in. The academic stamp of approval can also occur at the program level. Many business schools in Texas, for example, seek accreditation from the Association to Advance Collegiate Schools of Business (AACSB). In addition, psychology programs may earn accreditation from the American Psychological Association (APA). Such accreditations can show employers that graduates have the knowledge and skills they need to be successful in the industry. What are Texas’s requirements to qualify for in-state university tuition? The Texas Higher Education Coordinating Board determines whether students attending on-campus or online colleges in Texas qualify for in-state tuition. In general, residents are independent adults aged 18 or older who have lived in Texas for 12 consecutive months prior to the start of the school year. Residents must have been employed during that time before applying to a higher education institution. International students may qualify under current legislation for a waiver to pay the resident tuition rates but only if their visas specify that they are eligible to establish domicile in the U.S.
Are online credits more affordable in Texas than other places? How can I get help paying for online college in Texas? Online college students in Texas should explore a variety of financial aid sources in order to cover the costs of their education. The best place to start is the Free Application for Federal Student Aid (FAFSA). FAFSA opens the door to federally guaranteed student loans, grants, scholarships and work-study programs based on eligibility. Forms can be filled out online or printed and mailed. A host of scholarship programs are available for undergraduate students attending Texas colleges and universities, as well. Here are just a few that Texas students should look into. IMPACT Presidential Transfer Scholarship: This $9,000 scholarship is offered by Texas Tech University and awarded to incoming transfer students. Applicants must be Texas residents with a minimum GPA of 3.0 and have earned at least 30 hours of transferable credit from a community college. Larry Temple Scholarship: Offered by the University of Texas at Austin, this scholarship is available to College of Liberal Arts students who finished their freshman year studies with outstanding grades. Extracurricular activities, evidence of leadership and financial need are also considered. The scholarship amount is $11,000 and is renewable for two years. Lechner and McFadden Scholarships: Open to incoming freshmen at Texas A&M University, these scholarships are $2,500 per year for four years. Recipients must maintain a GPA of 3.5 or higher. National Scholars Scholarships and Awards: Texas A&M also offers scholarships and awards to nationally ranked students. National Merit semifinalists and finalists are awarded amounts ranging from $1,000 - $28,000. More information can be found on their website about National Merit scholar competitions and opportunities. Paulus Schroeter Scholarship: Offered by the Amarillo Area Foundation, this scholarship is available to graduating high school seniors who reside in any of the 26 northernmost counties of the Texas panhandle. The amount is $2,500 for up to eight semesters and is awarded based on evidence of outstanding leadership, community service and financial need. Online education plays a key role in socio-economic development efforts in Texas. Adult education courses are often used as a gateway to prepare students for online college courses and programs, both technically and academically. High school equivalency: There are three programs available to those whose first step towards college is to earn their high school diploma: the GED, HiSET and TASC tests. English language training/ESL: From basic level English literacy to more advanced classes for college degree holders from countries, language training in Texas comes in many levels. Senior citizen oriented learning: A recent movement to make college credits free for senior citizens means more students age 65+ are looking to brush up on their skills before going back to school. Texas A&M University provides a directory of literacy programs in the state, and the TASC provides a state-by-state listing of high school equivalency testing locations on their website for students searching for local service providers. Join Accredited Schools Online’s email list to receive the quarterly newsletter. Copyright © 2019 - www.AccreditedSchoolsOnline.org - All rights reserved.